- High quality camera for naturally stunning selfies. - A 5MP front-facing camera with countdown timer that guarantees high-quality selfies. To give those self-portraits an element of professionalism, the HTC One mini 2 also features Touch Up software for subtle beauty enhancements that smoothens skin, eliminates red eye and adjusts facial contours, while preserving natural looks. - HTC BoomSound(TM) - A small device that makes a big sound. 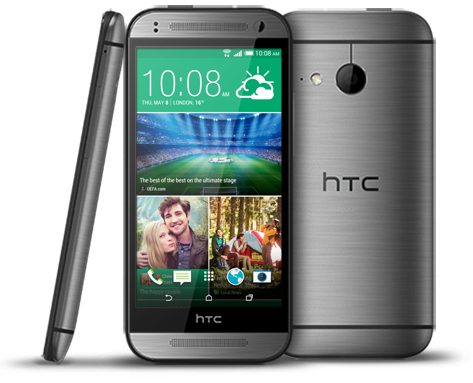 Equipped with the same amplifiers as the HTC One (M8), the One mini 2 delivers rich tones from bass through treble, producing high-quality, immersive sound through the dual frontal speakers that have become synonymous with the award-winning HTC One family. - HTC Sense 6 with BlinkFeed(TM) - Turning your home screen into a live stream of the latest news and social updates, HTC BlinkFeed(TM) makes the content that matters to you more accessible and easier to read than ever. Aggregating feeds from a growing list of over 1,000 partners, adaptable tiles display your social media updates and favourite news topics, giving you the latest online content directly to your home screen. - HTC Zoe Highlights and Zoe(TM) sharing app (coming in summer 2014) that allows you to create, share, and remix professional-quality video compilations of selfies, video clips and photos from the 13MP camera. For those unforgettable moments, the Remix function allows your followers to add their own photos, videos and soundtracks to create new Zoe Highlight videos that help you re-live the experience from every perspective.